No need to sign up for yet another portal or app. All your records in one place. No passwords. Get your records without having to remember any passwords. Medsender gives you unlimited, instant access to all of your health records, no matter where you are. No portal signup or account creation needed. Sharing your records with another doctor has never been easier. 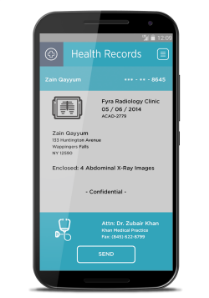 Share records from your phone or computer with any Doctor. Medsender's HIPAA compliant software contains security features to ensure that your health records remain under your control. Share when you want, protect when you don't. Get instant access to your medical data when your provider shares it using Medsender. No passwords, no lost paper copies. Coming soon: Get your records from providers even if they don't have Medsender. take control. ask your hospital or doctor about medsender today!